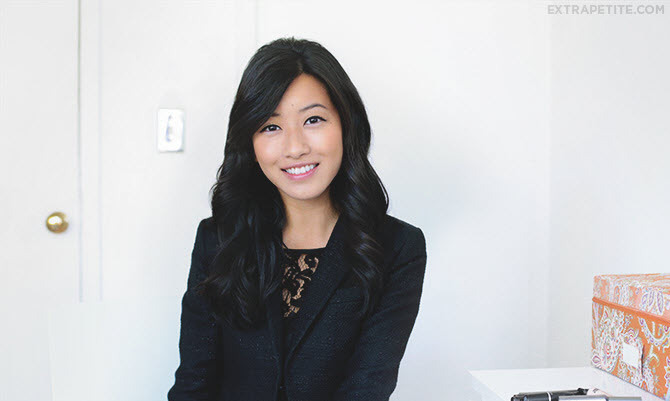 For those who are just starting out with makeup, I’ve teamed up with Nordstrom Beauty Spot to share my easy everyday look for work, and how to quickly build on it for after-work activities. This look features products that I’ve relied on for years, as well as some updates and tips from my in-store visit with one of their beauty stylists. When it’s time to replenish these favorites, you can bet I’ll be taking advantage of their online free shipping (at any price). For work, my focus is simply on even skin tone and opened-up eyes. I’d avoid colorful eyeshadow or bright cheeks and lips, and heavy makeup in general for professional settings. 1. Make sure to start and end each day with a clean, moisturized face. I used to have an issue with dry, flaky skin, which was exacerbated by makeup layered on top. I bought the Clarisonic Mia a few years back and have been using it 2-3 times a week (usually in the shower, for convenience). For me, it does a great job of removing makeup residue and keeping skin flake-free. During the winter when Bostonians are plagued with dryness, I may have caught Nick buzzing away with my Mia…(PS – buying replacement brush heads in bulk saves a little $, and also allows for hygienic sharing of one device). After cleansing I apply Eucerin lotion, which came recommended by my dermatologist for sensitive skin. 2. Many women have naturally good skin that doesn’t need to be covered by foundation – just a touch of concealer should suffice. MAC select cover-up (I use shade NC30) has been my go-to for years to help with redness and under-eye circles. I used to dab then smear, but was taught to dab then pat into your skin in small, light taps. Optional step: set the concealer with some powder (I use a light coat of powder foundation). 3. I went through a stage of amassing blushes in every color, then discovered this Stila “Sun” bronzer (I prefer Shade 1) and haven’t turned back. For my skin tone, it adds natural color without veering into the territories of oompa loompa orange or forgot-to-bathe brown. As with most products in this post, it’s on the pricey end but has lasted me for several years. Since bacteria can grow on makeup over time, I disinfect every so often by pouring rubbing alcohol into a spray bottle, spritzing onto the product and wiping the top layer off. 4. 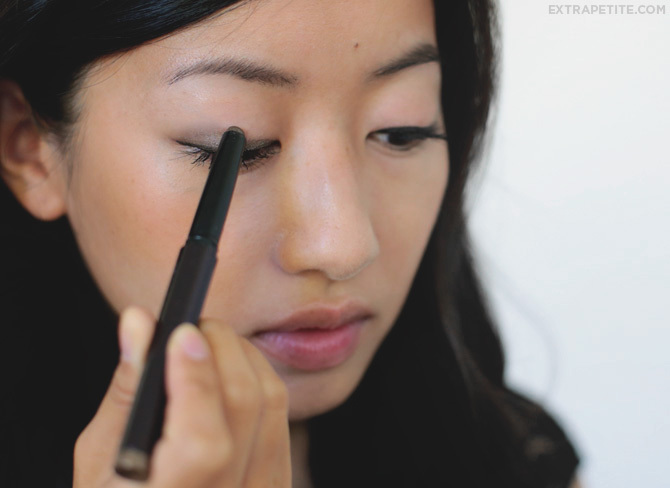 For Asian eyes, a little bit of liner goes a long way in playing up that feature. I tried a drugstore version of this Lorac Front of the Line PRO liner, but reverted back to the original for the better staying power and brush. I figured with so few products in my daily regimen, there’s no need to scrimp on something that works well. I start at the inside corner and use a light-handed continuous stroke, extending about a cm beyond the outer corner. 5. I’ve been a longtime user of Lancôme Définicils mascara (results in wonderfully well-separated and defined lashes), but it doesn’t do much volume-wise for my thin, sparse lashes. My beauty stylist suggested a few options, and mentioned that Clinique’s mascaras (starting at $16) were on the more affordable end of the range. After trying the testers, I purchased the Clinique High Impact Extreme Volume mascara. The below left shows my natural lashes after curling, and below right is after 2-3 coats of mascara. Resulting lashes are not as defined as with the Lancôme, but have noticeably more mass than my natural ones. To take this very natural look to something a touch more dramatic, simply build on the eyes and add a lip color. I received my first Laura Mercier caviar eye stick as a gift years ago, and have since hooked so many friends onto it. My go-to “Khaki” color is a silky dark taupe with a little shimmer (I’m not a shimmer person, but this just adds some depth). Unblended, this eye stick can serve as a creamy eyeliner. Blended, it fades into a smoky eyeshadow. If blending, I learned from my beauty stylist to apply one eye at a time then blend with short, quick finger strokes immediately after application, since the cream formula takes just a few moments to “set” and will not budge or crease afterwards. I always keep this little stick in my purse, and take 30 seconds to apply it at my desk before heading out to dinner or drinks. No more having to pack large eyeshadow palettes with brushes and primer, or cleaning up messy shadow fallout from cheeks and clothes. This stick has excellent staying power on even my oily lids, and wipes off easily with my trusty Lancome Bi-Facil eye makeup remover (look for these in those nifty gift with purchase sets!). For those of you with busy schedules, please share your time-saving beauty tips – I’d love to hear them! Disclosure: This post was sponsored by Nordstrom Beauty Spot – visit for makeup tips, beauty DIYs & more. I am not the same Anon as any above. Well put. I am Asian and race did not come to mind until seeing these comments, but the discussion has been thought provoking. Hi there – I wanted to, but my current camera doesn't auto focus so I unfortunately wasn't able to show close-up application clearly. Hi Ying! Yes, it is! It's lasted such a long time. Great job picking out a shade – it's so natural looking. Thanks for sharing about Benetint! I have it lying around for a while but haven't tried it. Am feeling encouraged to. Michelle – thanks for saying hello, and welcome! You are so right about organization. I rely on my sorting box from Marshalls. Interesting! I've seen the older techniques on women when I visit China and it unfortunately didn't look very natural (esp. the harsh brows). Am curious how recent advancements have improved that service. I finally discovered They're Real (through a gift, after purchasing the mascara shown in this post) and totally agree with you two – it's awesome! Hi Jan! I've heard such good things about LM tinted moisturizer, I hope you like the caviar stick just as much. Unfortunately I don't have brush recommendations as I've been using this Rock & Republic blush brush for years and haven't had to find a replacement yet. Haha I don't think you'll regret it! And if you're light-handed, one stick will last for years. It's old from Marshalls, but I have seen occasional similar boxes at there/TJMaxx/ Homegoods in the home decor section, where all the organizational compartments are! great tutorial! can't wait to try it on myself! Would love to hear your thoughts on Benetint after you've tried it out. I also use Lancome Bi-Facil eye makeup remover, and if I could, I would get all my makeup rose-scented. Hi Jean- What is the cleanser that you use on a daily basis? thanks jean 🙂 great post! Thanks for the tips! I really like your MAC lip color. Do you get into trouble with it going onto teeth? I bought a really Red MAC color and I love it but I am super paranoid >.< But I love how natural this is, I may get it too! "It's just a generic term, like people will say African Americans tend to have colored skin even some of them are really fair skin." No, no and no. No one with any common sense uses this term to refer to AA skin. It is not acceptable and certainly not in North America. I just wanted to say how much I enjoyed your old Life with PAG posts! Please consider doing them sometime again (: It's so interesting getting to know you! Anon, I had a similar reaction to Jean's statement about Asian eyes. 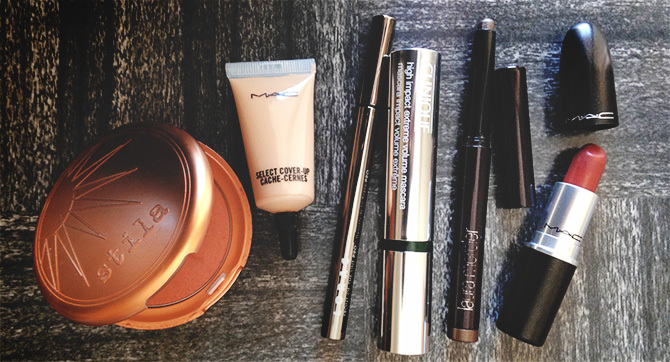 I am Asian and eyeliner is typically the only makeup I wear (I like the Lorac Pro as well). My first thought was "what? Aren't my eyes Asian too?" I have double lids and they look great with a fat smudgy line. Jean, I hate to say it but this post reminds me of why I don't read your blog much anymore. It's gotten too commercial. I like makeup and Nordies as much as anyone else, but I find your endorsement of products to be rather gauche – two pictures of the pricy clarisonic before the jump? I'm honestly reluctant to believe that you've had one for a few years because I know from personal experience that their batteries don't last that long with such regular use. I'm happy that you are able to be compensated for your tremendous effort on this blog, but I'm disappointed to feel that I can't trust your recommendations anymore. Hi there, I hope readers of this blog know that I would not be dishonest in order to endorse a product and am sorry to hear you feel that way. 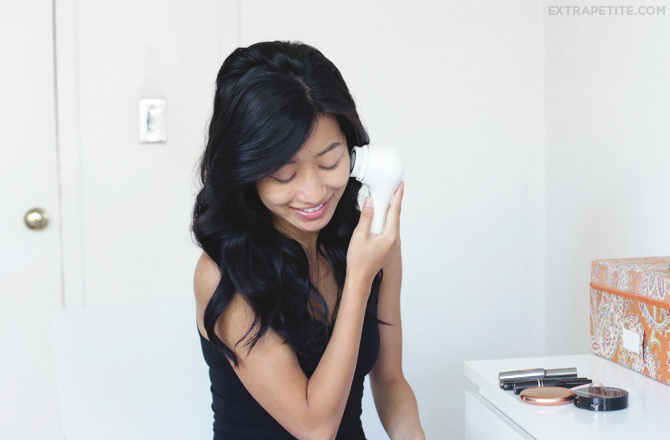 I purchased my Clarisonic nearly 3 years ago and have mentioned it several times on my blog since because I've been very happy with it. I posted the photo of it first since it's the step that happens before any makeup is applied, and used it for the 'before and after' photo for the same reason. Jean, fun post!! 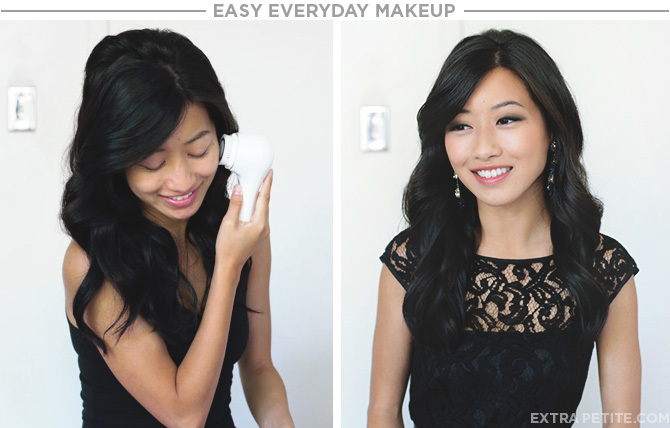 What powder foundation do you like for daily use? I think Chinese eyes would be a better expression because, for example, the charasterics of Japanese eyes have slight differences. To be honest I hate generalizations… The population of Asia is approx 4 282 816 000 which makes it very silly to rely on stereotypes. Yes I am curious as well! You mention an optional powder foundation but it's not on this post? Could you tell us what it is? Btw that's my fave mascara too! Why make this so serious? it is merely just a commonly understandable term, "asian eyes." Jean used it so everyone can understand right away what she is talking about. It is what language is for – to understand each other. Please, just relax, not be "politically correct" all the time, and unclench, for god's sake! The fact people get defensive is merely lack of confidence at this point. It is utterly ridiculous to have posted such a negative note on a good post! Hi Jean, I recently discovered your post through wendy's look book and am really enjoying reading your blog! I am a physician and my makeup routine has been practically nonexistent: I used a Burt's bee tinted moisturizer for my lips and that was about it. I always thought that my patients would benefit from my knowledge and not my looks. But now I want to look more polished when I interact with my colleagues and your beauty tips will undoubtedly come in handy. Thank you so much! Great tutorial Jean. Love the Clarisonic. Changed my skin especially after moving from beautiful San Francisco to busy New York. My skin has already experienced so many changes and the Clarisonic has really helped. Kudos to you for always being well mannered and proper when addressing your audience. Hi there – I use Make Up For Ever duo mat powder foundation sometimes to set concealer and make it look smoothed over. I really like it and it lasts for ages! You say you are Asian, but you don't know what she means by Asian eyes? Troll much?